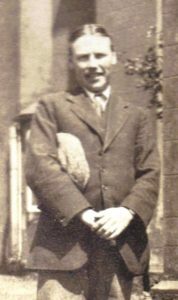 Noel Downing was born in Moorfields, Church Lane, Handsworth on 16 Dec 1888, the only son and youngest child of William Edmund Downing. The records relating to him on this site are divided into a number of separate pages with some examples of the range of archives and material that still exist. He worked at his father’s firm G and W E Downing Maltsters from 1911 until he enlisted in Sep 1914 and joined first the Public Schools Battalion and later obtained a commission in the Welsh Guards. In 1895 the Downing family had moved from Handsworth to Elm Lodge, Hagley. At about the same time the Evans family moved in next door at The Lawn, Hagley. The two families were close together. Letters written at the height of the First World War indicate that both Wilmot Evans, Mary Downing, Molly Evans and Noel Downing were all close in the life changing events of the battles in Northern France. Molly and Noel went on to marry on 29 July 1919 – Wilmot Evans died on the Somme in July 1916. Noel returned from the trenches to take up the mantle of the family malting business – but this was in serious decline by the 1920’s. Certainly the family fortunes were adversely affected by the depression. The young family of three daughters were brought up in Edgbaston and moved from 16 Woodbourne Road (1919) to 11 Fitzroy Avenue (1928) and eventually to 47 Selwyn Road (1932). Noel retained his love of the outdoor life and paid frequent visits to his father’s hunting lodge at the Beacon, Radnorshire. His father did not in fact die until 1939. During the Second World War he served as a Reserve Constable, by which time the family business appears to have been radically reduced in activity. In 1945 his father’s estates and the remaining business was all finally wound up and Molly and Noel retired to Upton in Hampshre, where he spent the last twenty years of his life. Throughout his life Noel retained a keen interest in Amateur Dramatics – from his school days to his retirement in Hurstbourne Tarrant there is record of his amateur thespian career.